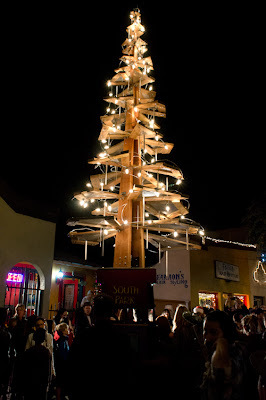 Crowds of people filled Grape Street Square to watch South Park’s first holiday tree sculpture light up the night. But this wasn’t your typical green Christmas tree, because South Park is not your typical urban setting. Todd Williams, the artist who designed the sculpture, has tree cred. He was involved in the San Diego Port District’s Urban Trees public art project, and he also created the unusual metal tree sculpture at Alchemy restaurant. The idea behind South Park’s tree sculpture was to 1) celebrate the holidays without killing a tree, and 2) use recycled, reused materials to reflect an urban setting. That lovely tree was once a wood fence, if you can believe it. You can also see how it’s constructed with nuts and bolts, those “individual elements coming together” that make a community, Williams said. You could witness those different elements as local business owners, families, renters and homeowners, school kids, the elderly, gay and straight celebrated what was called First Light, the official kickoff of Luminaria, South Park’s first month-long celebration of light. We’re not a cookie-cutter neighborhood, because we’re not cookie-cutter people. We come from different backgrounds, yet what binds us together is love and appreciation for our little town. The PA system at First Light made it tough to hear the speeches and presentations, but if you missed it, you should know that the South Park Business Group that organized the Luminaria named the winners of the home decorating contest. The winning homes were 1707 Fern St. for best overall design; 1920 Fern St. for most original; and 1738 30th St. for best door. Be sure to drive by these locations to experience what our creative neighbors have done to add sparkle to South Park. You can also see the winners on Facebook. KUSI News and ABC News came to First Light, as well as special guests interim Mayor Todd Gloria, Assemblywoman Toni Atkins, and Santa, of course. Photos and article courtesy of Bonnie Nicholls, the South Park Scribe, your expert on all things in South Park San Diego! Bonnie Nicholls is a freelance writer and blogger based in South Park, San Diego. She specializes in business success stories and web content. You can find her on Twitter.